I haven’t shared any home cooking for a while, mainly because I’ve been out more than the cat over the last few months. I’ve been eating and drinking out pretty much constantly since we got married in October, but now it’s January (and my clothes no longer fit me) I thought I’d make an effort to get back in the kitchen. Before Christmas I had been enjoying trying more vegetarian and vegan food in the city, especially enjoying the offerings at Natural Healthy Foods, Mowgli, and Hen and Chickens. 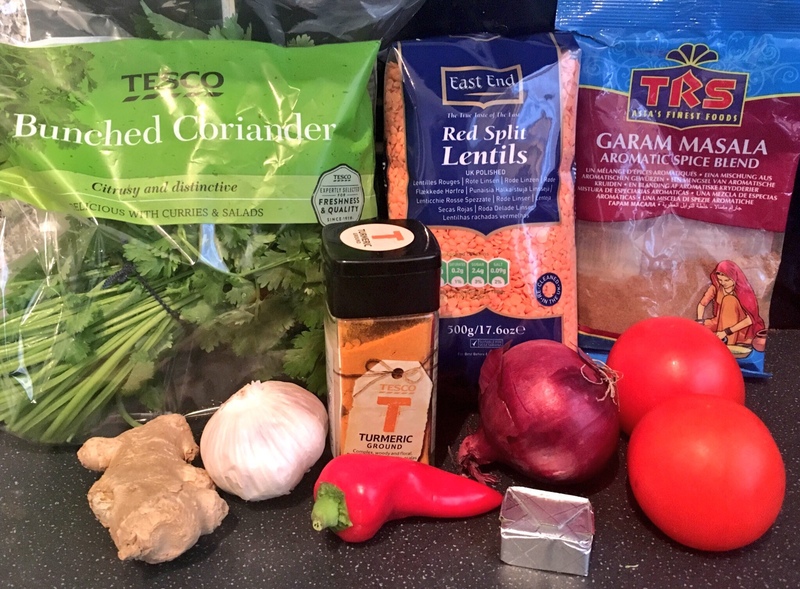 The latter is where I discovered (what I think might be) the best tarka dhal I’ve ever eaten, so when I found myself stuck at home earlier this week I decided to try and make my own. 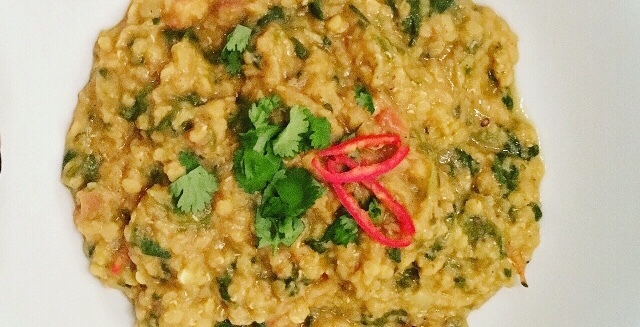 I am no expert when it comes to Indian cooking (or vegan food for that matter) but I’m a big fan of experimenting and learning as I go, so my recipe below is very much based on creativity rather than knowledge. 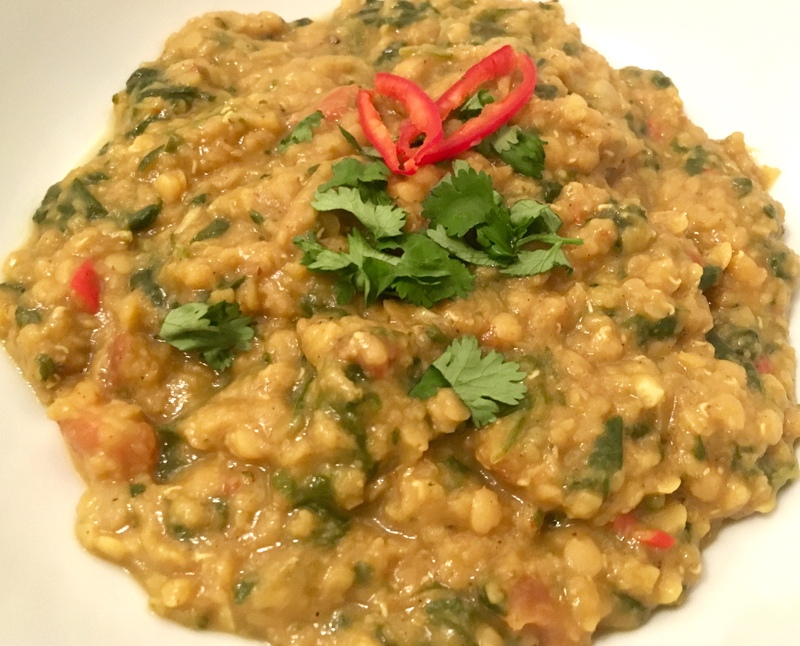 I have no doubt this is not remotely an authentic dhal, but it is delicious, easy and extremely economical; I spent about £4 on ingredients and it fed me for 3 days. 1) Cover the red lentils in 2-3 inches of cold water and bring to the boil. Add the turmeric and leave to simmer for 5 minutes. Skim off any scum that floats to the top. 2) In a small frying pan cook off the tomatoes, onions, garlic, chilli and spices in a generous spoonful of butter. 3) Add the contents of the frying pan to the lentils with another spoonful of butter and cook together on a low heat for 30-45 minutes. I like mine quite mushy but if you prefer more bite cook for less time. 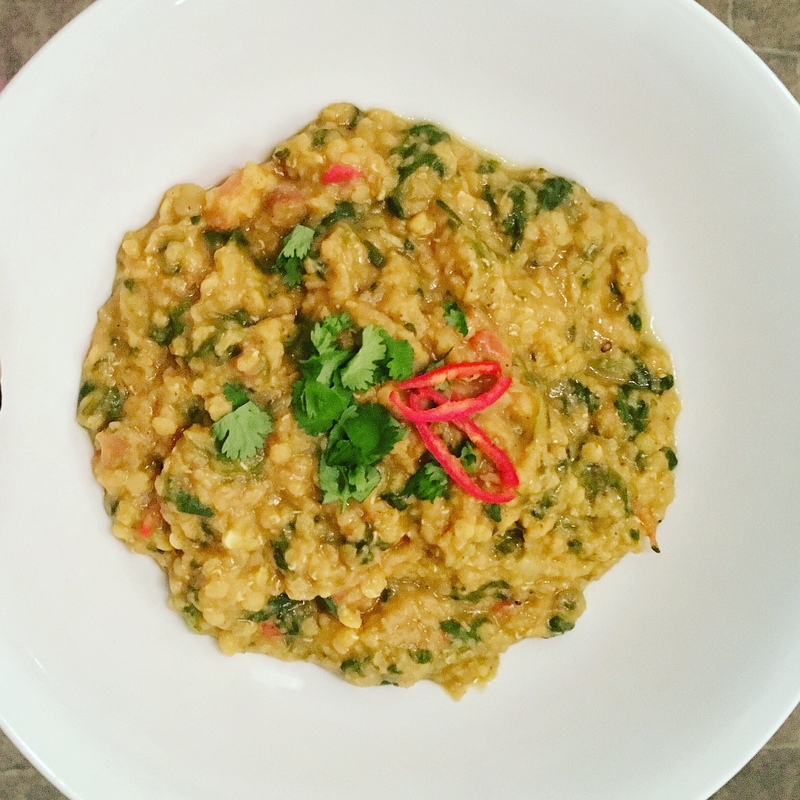 4) Add the spinach 2 minutes before serving, and garnish with coriander and fresh chillies to suit. Grab a spoon and delve in, or use garlic naan to mop it up; either way it’s filling and tasty. Note: I also added some smoked paprika to mine for depth.